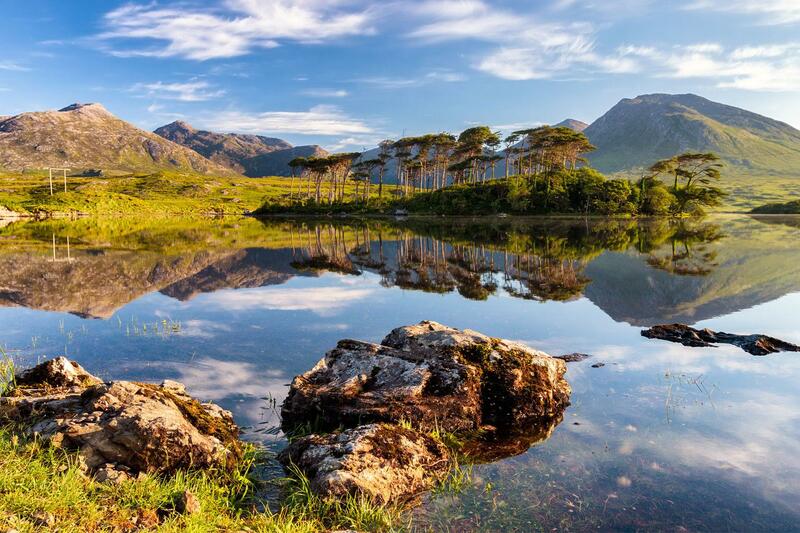 Connemara National Park is an iconic wild landscape offering coastal, island and mountain discovery, on the western edge of Europe. As Oscar Wilde put it “Connemara is a savage beauty” and the best way to explore it is on foot. Experience the unforgettable views across to the Twelve Ben Mountains and the small bays and coves of its sublime peninsulas that reach out into the ocean. This is a stunning section of the Wild Atlantic Way. Experience Clifden, Connemara’s capital and its emerging reputation for the best food on Ireland’s west coast. Enjoy tasty seafood such as crab claws with delicious soda bread. Then walk the very pretty Aughrus peninsula, cross the sand flats to the tidal Isle of Omey and board a ferry to pretty Inishbofin Island. Walk the Western Way from Lough Inagh to Leenane, situated at the head of Killary Harbour, the Emerald Isle’s only true fjord. Clifden, on Ireland’s west coast is located in an area of great natural beauty and easily accessible from Galway (1H30) by local bus. 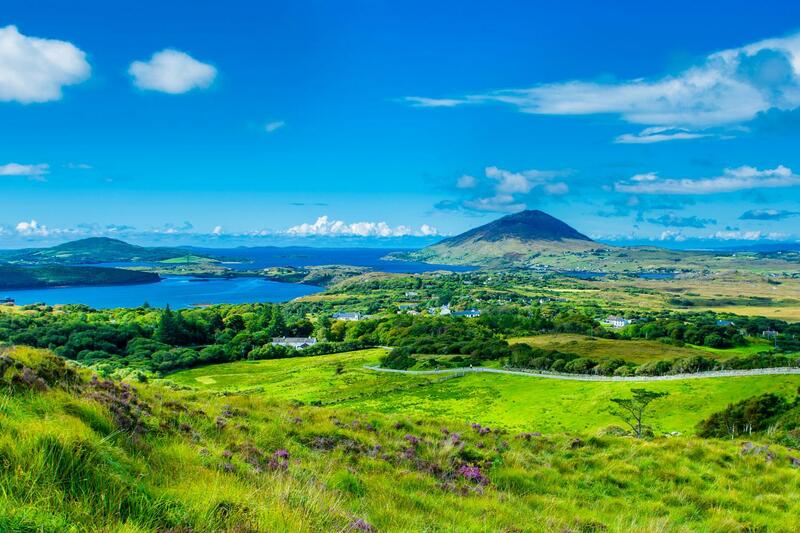 This picturesque town is the capital of Connemara and has a delightful setting between the foothills of the Twelve Bens Mountains and the Atlantic Ocean. It is also renowned as the “gourmet capital” of western Ireland and there are many fine-dining restaurants where you can enjoy delicious fresh seafood. 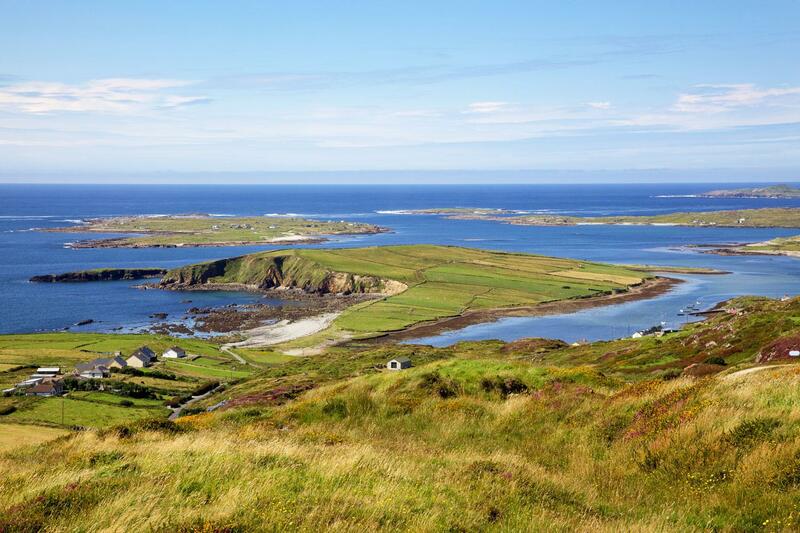 Beginning in the centre of Clifden take a delightful loop walk along a peninsula. 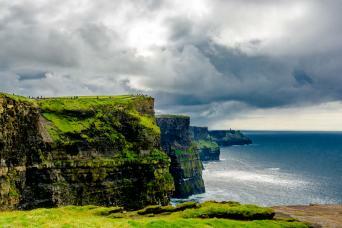 Very few places in Ireland can match the rugged beauty and range of scenery that can be seen from the Sky Road. You will also pass Clifden Castle, beach and on the hill opposite see views of a monument to John D’Arcy, the founder of Clifden and the man who built the castle. This evening we recommend dinner at Foyle’s Hotel on Main Street as it has a reputation for great cuisine, such as roast rack of Connemara lamb. After your transfer brings you to Cleggan and its little port, take a ferry to the beautiful island of Inishbofin located 7 miles off shore. (The only ferry leaves late morning and returns in the late afternoon, takes approximately 30 minutes and is payable locally or you can pre-book). 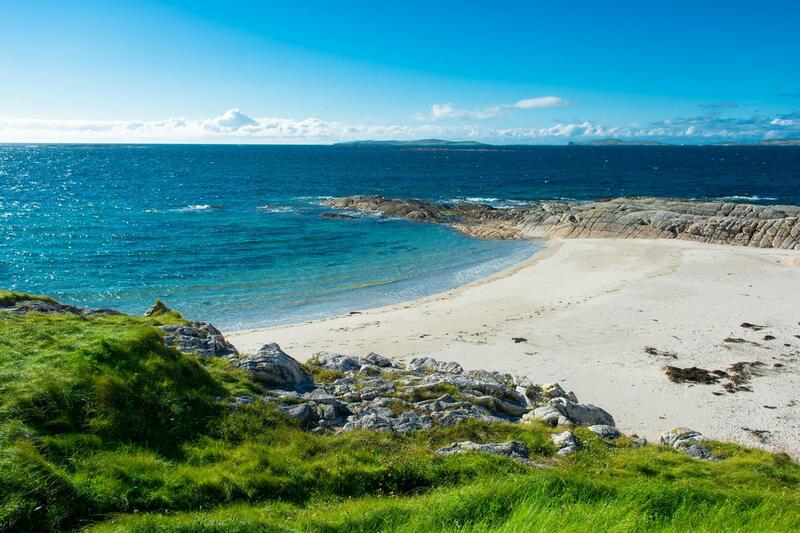 Translated as “Island of the White Cow” Inishbofin is only 6km by 4km but really packs a punch considering its size with award-winning beaches, crystal-clear water, and a breeding area for many species of birds, such as the Corncrake. It is also a centre of traditional music and song. Take a loop walk discovering the wild Atlantic landscapes and encountering evidence of early Christian inhabitants such as a ruined chapel. Set off from your accommodation in Cleggan walking across the Aughrus peninsula south, until the tidal island of Omey comes into view. Only 600m offshore this is a magical island, nestled beneath the projecting prow of the Aughrus peninsula and is protected from the Atlantic by other smaller islands. In the mid 19th century the island supported a population of over 400 people who lived off the rich fishing around the island and from cattle raised on the fertile, lime-rich soils. 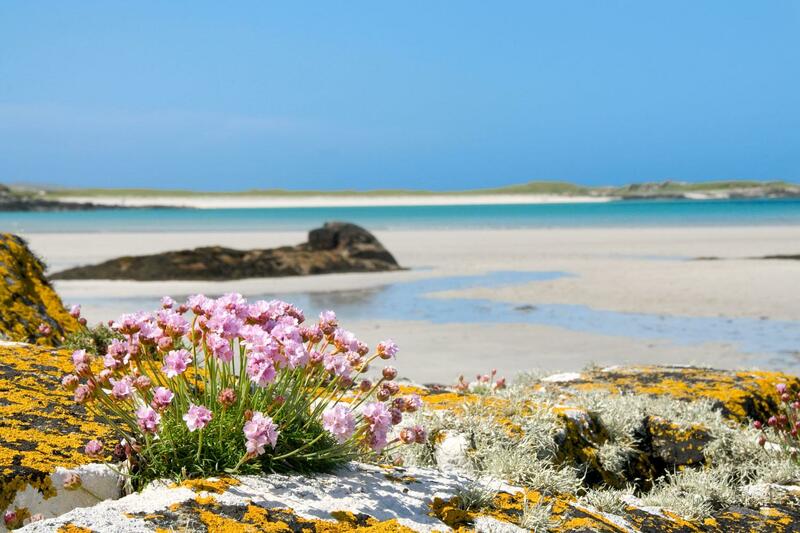 Today there is no better place for a leisurely, interesting and invigorating walk than St Feichin’s sacred island. As it is a tidal island please check the tides before walking today. This may mean walking in the early morning or late afternoon if necessary, you will need to be flexible. A transfer (35 mins) brings you to the foothills of the Maumturks, a picturesque mountain range. Starting from close to Lough Inagh you then walk along the Western Way trail all the way into the village of Leenane. Fantastic views will surround you as you walk, yet the walking is relatively easy. Settle into your accommodation in Leenane, overlooking Killary Harbour, Ireland’s only fjord. Tonight walk into the village and enjoy the “craic” over a pint of Guinness in the local pub. A transfer to either Maam Cross or Clifden is included (20 or 30 minutes). From these 2 places, you can take buses to Galway. From Galway, there are connections to Shannon or Dublin Airports. The accommodations on this tour are a variety of hotels, B&B’s and guest houses. In Clifden the accommodation is of a higher standard as there are a number of choices. In Cleggan the accommodation is in simple yet very comfortable B&B’s. In Leenane the rooms are also simple but comfortable. However all-in-all they offer a particularly warm welcome, traditional hospitality and delicious full or continental Irish breakfasts. We will be happy to accommodate your party with single rooms if requested, and a single supplement applies. This trip is also available to solo walkers, and a supplement is again payable (as some costs are not shared). Please note that singles may not be of the same standard as twins/doubles. A hearty Irish breakfast is included each morning. Lunch and dinner are not included so you are free to choose from the available options. Most of your accommodations will more than happy to provide a packed lunch on request and this can be booked on arrival. Alternatively you can buy lunch in local shops/cafés. For dinner there are nearby pubs and restaurants in each location. Enjoy the comfort and charm of staying in this historical Georgian country house.The rooms demonstrate elegance and cosy warmth, plus all the benefits of modern conveniences, like the en-suite bathrooms. The Clifden Station House Hotel is a most welcoming hotel and has 78 lovely and spacious bedrooms, complimentary high speed Wi-Fi and a bar and restaurant in which to relax. You will receive a very warm welcome at this B&B which has fantastic views to the Twelve Bens Mountains and small islands out in the Atlantic.It is a great place to relax after your day of walking. Harbour House offers an award winning spacious family run B&B situated in the picturesque fishing village of Cleggan, where home baking and a warm family welcomes you. 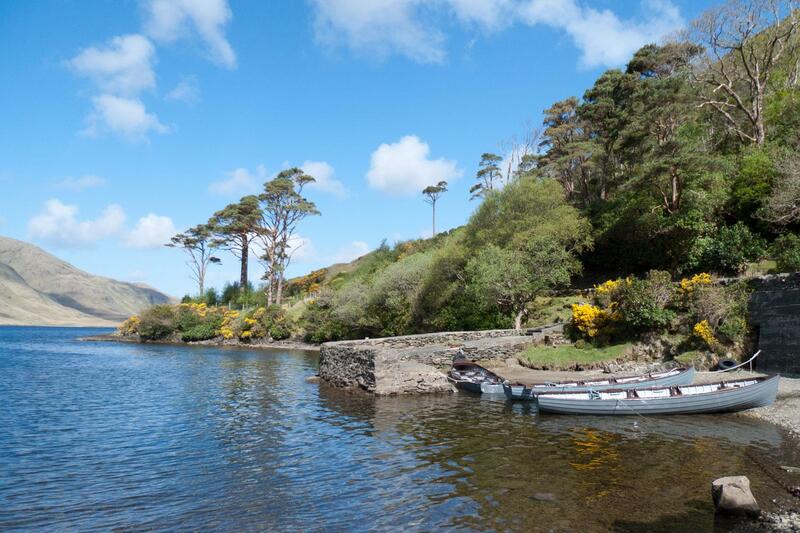 Portfinn Lodge has 11 comfortable en suite rooms which have spectacular views of either Killary Fjord or the Maumturk mountains. This Hotel has 66 en suite guest bedrooms with the majority of them providing views of Killary Harbour and some of them with a view of mountains. Each room is uniquely styled in keeping with the hotel’s character. This walking tour is available between mid-April to mid-October. You can start on any date subject to availability. The walk is very popular so it is best to book as far in advance as you are able to. This itinerary is graded easy to moderate and is suitable for regular walkers. There are very few elevation gains and losses and the most you will encounter is 150m elevation gain on a couple of the walks. It must be noted that in Ireland there are no “public rights of way”. Therefore this itinerary does involve walking on roads which have low traffic, especially on the first few days so you will need to feel comfortable with walking on tarmacked surfaces. This is unavoidable to experience this area on foot, which is stunning, however at times you may have to watch out for traffic. The roads are pleasant to walk on though with great views and always with a friendly wave from the locals. The routes on this tour are not generally way-marked, except on the Western Way, However we provide you with route notes and detailed maps which will help you find your way. As much of the walking is on rural roads the navigation is not at all difficult and it is also possible to ask us for information about our Macs Adventure App. The ferry from Cleggan pier to the Island of Inishbofin takes approximately 30 minutes. For ferry information use the following website, Inishbofin Island Discovery. There is one ferry that leaves at approximately 11:30am and returns at approximately 5:00pm. However please be sure to view up to date timetables as during Easter week and on bank holidays schedules are different. We recommend buying your return ticket (approx €20) on the website in advance, although you can also buy a ticket locally. Please note that schedules may change according to the tide and weather conditions and the ferry company also reserves the right to cancel ferries if the weather is extreme. The distances and descents / ascents are approximations of the recommended routes. Please be prepared by packing all necessary items, for example, proper rain gear (jacket and pants), sun hat and sunscreen. Your information pack has a detailed equipment list which includes standard walking/ cycling gear such as good walking boots or shoes, warm and waterproof clothes for the cooler months and lightweight clothing for summer, and a day pack. There is access to Galway from Dublin Airport on a Citylink bus. They run every hour and the journey takes about 3H. From Galway there is a Citylink bus to Clifden, which takes 1H30 and they run every 2-3 hours. Other useful travel websites are Bus Eireann and Irish Rail. Should you wish to fly into Shannon Airport, there is also access from here to Clifden. Take a bus from Shannon Airport to Galway (1H40) and then the Citylink bus as described above from Galway to Clifden. From Leenane a private transfer is included to either Maam Cross or Clifden (20 and 30 minute drives respectively). Citylink buses are available from both these locations to Galway, from where you can travel by bus to Dublin or Shannon Airports. Your baggage will be transferred from your accommodation as per your itinerary and moved onto your next overnight accommodation. We ask you to limit your luggage to one bag of up to 20kg per person. We suggest you book as soon as your plans are finalised as this area of Ireland is extremely popular , especially during the summer months. You will find up to date availability on our website and we will always try and accommodate your plans. We operate the tour to coincide with accommodations being open and weather being more conducive to walking. However, this is the west coast of Ireland, so it could be beautiful sunny days or there could be rain and wind. It's unpredictable so booking with this knowledge the correct gear will ensure that you have a wonderful time. July and August will be busier than at other times. Spring is early here so the spring flowers will definitely be out by April and by May trees and shrubs will all be blossoming. This was our 2nd Macs walk in two years, and we really enjoyed overall. The Irish countryside was beautiful and we got lucky with the Irish "heatwave" with only one cloudy day and the others perfect sunshine and warm temps. 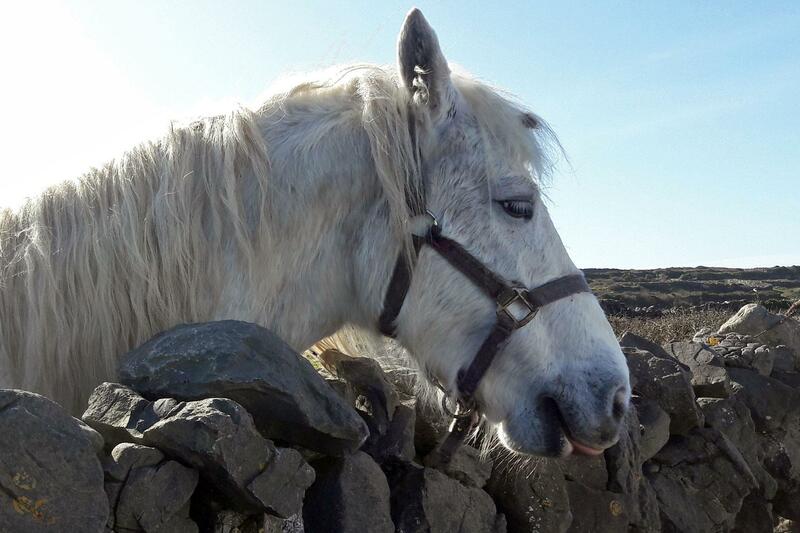 The one thing we would suggest is less walking on the narrow Irish roads. Day One - Sky Road has beautiful views but is almost all on the roads with frequent cars racing by on the very narrow lane. Day Three - Omey Island again beautiful island views and nice pasture/field walking but there we walked 2 miles or so each way to get there - at least this road was not heavily traveled. Would have preferred more field/woods walking to the road. Day Two - Inishbofin Island from the ferry was great and a nice mix of pastures/road, and Day Four - Connemara National Park was the highlight for sure! Gorgeous pasture walking between beautiful hills/mountains and finally coming out to the Killary Harbor was the gem of this trip. Accommodations were great throughout. Day 1: Arrive Clifden and overnight. Day 2: Sky Road Loop Walk from Clifden, 17 km. Day 3: Transfer to Cleggan. Ferry to Inishbofin Island and Walk, 11 km. Day 4: Omey Island Loop Walk, 14 km. Day 5: The Western Way to Leenane, 17 km. 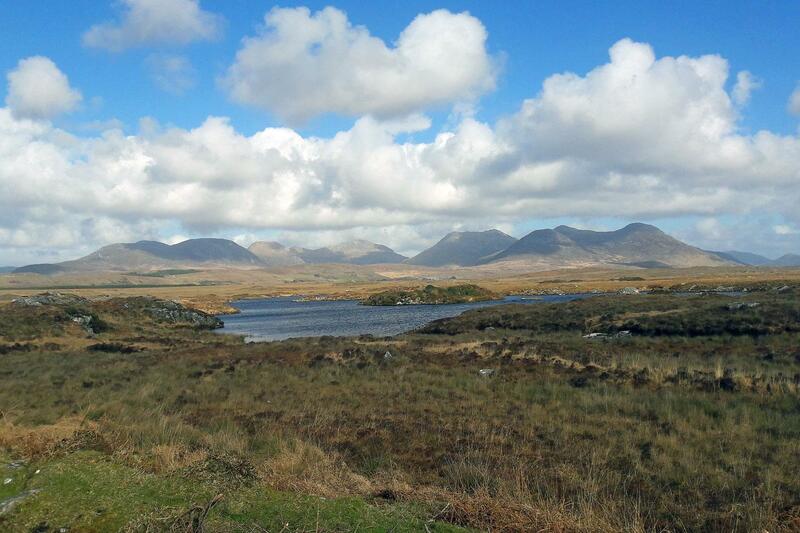 If you want to see the unspoilt and rugged beauty of Connemara in all its glory whilst taking relatively easy walks, with very few elevation gains and losses, then you should definitely take this tour. 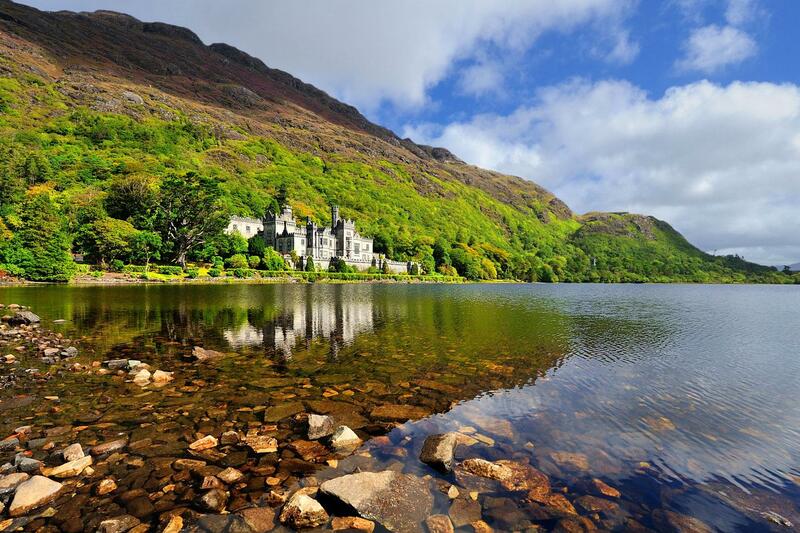 The warmth of the Irish people is second to none, the food and pub culture is incredible and the variety of walks along peninsulas, on islands and in the foothills the mountains, all capture the spirit of this truly magical part of Ireland.